← 426 "Homer and Lisa Exchange Cross Words"
"I'm sorry. It's just so fun and easy to judge people based on religion." Bart is writing on the blackboard "I will not take the blackboard home." "MyPods and Boomsticks" is four hundred and twenty seventh episode of The Simpsons and the seventh episode of the twentieth season. "Bart befriends Bashir bin Laden, a Muslim boy who's new at school, and invites him and his parents over for dinner. Unfortunately Homer's paranoia gets the better of him and he ends up offending Bashir and his parents. Homer goes over to the bin Laden home to apologize, but his paranoia strikes again when he sees Bashir's father with sticks of TNT and thinks he's going to blow up Springfield Mall. Meanwhile, Lisa gets a Mapple MyPod – and a bill for over 1200 downloaded songs at 99 cents each." It's just after Christmas, and the workers of Springfield Mall are busily destroying all traces of the recent holiday. Marge observes, "They sure give the Christmas spirit the bum's rush around here." The Simpson family are in the mall to return 15-month kitten calenders that Bart gave as presents to everyone. Lisa spots a Mapple Store and the Simpsons go in. Lisa is enthralled with all of the Mapple products in the store, but can't afford any of them, not even the fake earbuds (MyPhonies) which cost $40. However, she sees Krusty with a MyPod, complaining that he cannot watch movies on such a small screen and griping about the selection of music. Disgusted with the MyPod, Krusty gives it to Lisa, which makes her very happy. Just then, a voice on the speaker system says that Steve Mobbs, the founder and CIO (Chief Imaginative Officer) of Mapple, is about to make an important announcement. Seeing the opportunity for a prank, Bart breaks into Mobbs' announcement and impersonates him, calling everyone in the store losers and telling them that the MyPhones, which sell for $500, cost eight dollars to make and he pees on every one. Furthermore, he invests the profits in Microsoft, and he and his boyfriend Bill Gates kiss each other on a pile of their money. The Mapple Store customers and employees are shocked at this, and Lisa quickly tells them that it was Bart playing a prank. The Mapple employees advance on Bart, but he flees the Mapple store and gets away. Then he smells something good and goes to check it out: it's a new family in town, Bashir bin Laden and his mother Mina (who have just moved to Springfield from Jordan), and what Bart smelled was the lamb they were cooking for dinner. Bashir offers Bart a bite of lamb, which Bart enjoys, and the two become fast friends. The next morning, Bart and Bashir walk to school together, and Bart tells Bashir all of the important information about Springfield Elementary School, including the popular nicknames for Principal Skinner and Groundskeeper Willie, and that the only sure-fire safe food in the cafeteria is pork chops. At the last fact, Bashir tells Bart that his religion forbids him from eating pork, and Bart warns Bashir not to let the bullies find out that he practices a different religion. Unfortunately, the bullies overhear that part of the conversation and surround Bashir. When Bashir says he is Muslim, the bullies advance on him to beat him up. Bart stops them and tells them that they all have different religions: Jimbo is Christian, Dolph is Jewish, and Kearney is in the religion that Moe started. Dolph and Jimbo start beating up Kearney, and with the bullies now distracted, Bart and Bashir get away. When school is over, Bashir and Bart walk home, and Bashir meets Homer when he goes back to the Simpson home to return Bart's slingshot. Homer is impressed with Bashir's thoughtfulness and politeness, as he calls Homer "Sir." Homer told his friends at Moe's that he is great, but Moe warns him about Bashir and his family because they might be terrorists. 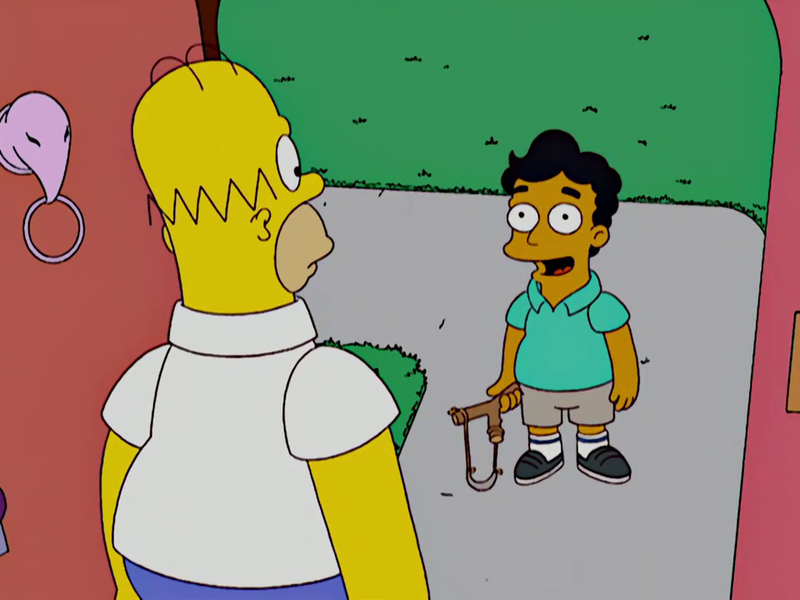 Homer doesn't believe him, until he showed him a clip from 24. Homer invited them to a dinner and he was about to kill them by a poison American Flag cake, but he can't because he wanted Lenny to see it, but he said he got soap in his eyes and that his mom said they have to go. Before he could apologize, he saw Bashir's father unloading dynamite and left. Homer told Marge about them being terrorists, but Marge tells him he didn't see anything. Homer has a nightmare in which the genie from Aladdin begins changing U.S culture into Islamic culture included a Christian church turn into a Muslim church, the bullies turn into a mafia style and all the genres have been turn into Cat Stevens music. Homer went back to Bashir's house and he thought he is really a terrorist, but he wanted a good business. Homer went to their for tea with Bashir's and he looked at their computer and he found out that he is blowing up the Springfield Mall. He warned everyone to get out of the mall and he saw Bart with Bashir and his father. It is revealed that Bashir's father is actually a worker who gets paid for blowing up abandoned Springfield buildings by using mathematics to find if the explosion is safe and he is actually gonna blow up the old Springfield Mall. Homer took the dynamite out of the mall and throw it on the bridge which supposed to be open tomorrow and Homer saved the Duff beer that was on the truck. The family throws a party to apologize about thinking the family are terrorists and for exploding the bridge. Meanwhile, Lisa has been enjoying her MyPod. At first, Lisa shares the fun with Sherri and Terri, as the three of them watch an Itchy & Scratchy video that she downloaded, but later Lisa becomes so addicted to her MyPod (downloading lots of songs from MyTunes) that it puts a strain on their friendship. Eventually, Lisa receives a massive MyBill for $1200 and is completely shocked, but then she realizes that she downloaded 1,212 songs that cost 99 cents each, which explains the large bill. Lisa then travels to Mapple's undersea headquarters (which takes a month, and the cost will be added to her MyBill) and asks Steve Mobbs for a reduced payment plan for her bill. Mobbs listens sympathetically, but then tells her that even though Mapple's posters say "Think Differently," the company's real motto is "No Refunds." He then offers Lisa a job working for Mapple (apparently, to make good her debt). 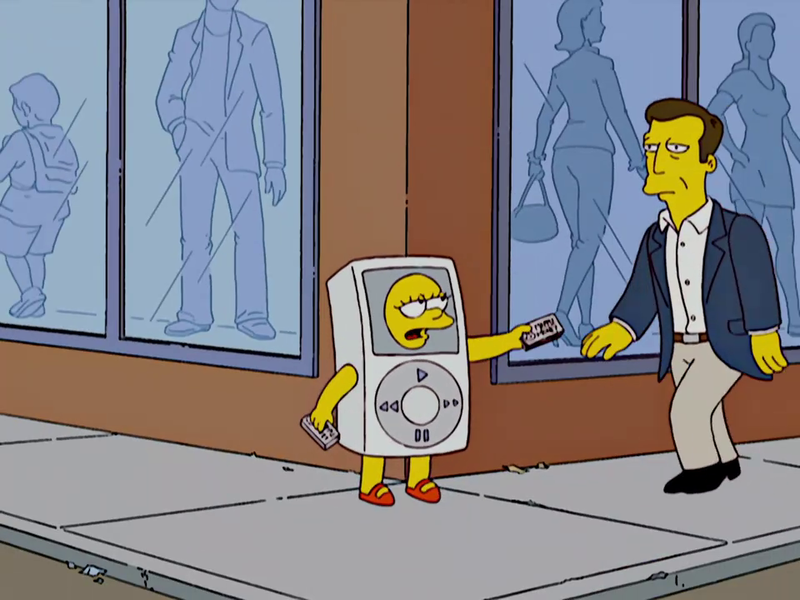 Lisa is at first pleased about the job, but she ends up as a mascot in a MyPod costume, standing on a street corner, handing out Mapple flyers to people and telling them to "think differently". The episode was written by Marc Wilmore and directed by Steven Dean Moore. Shohreh Aghdashloo guest starred. IGN praised the episode; as a whole, he called the episode funny and "gave the now familiar 'suspected terrorist' plot a Simpsons twist," but called the remainder of the Mapple storyline less impressive. TV Guide also praised the episode for its jokes but criticized the lack of flow, saying it was "one step behind." 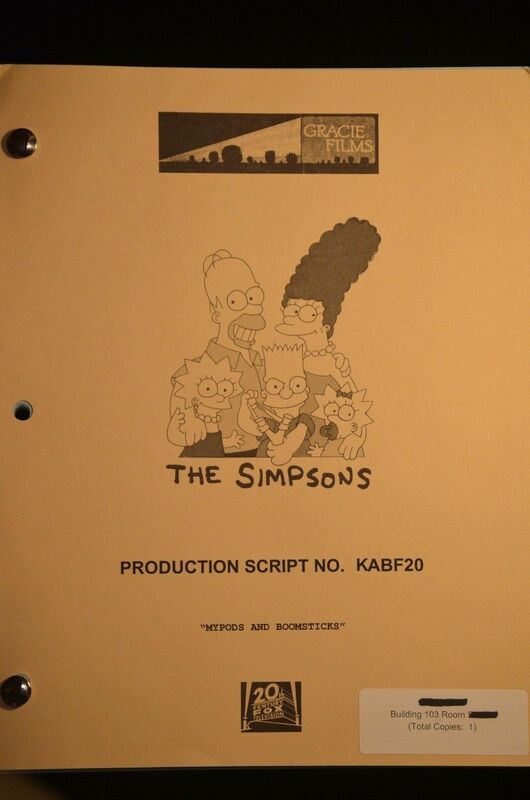 The Council on American-Islamic Relations praised the episode and sent a letter of commendation to Matt Groening. 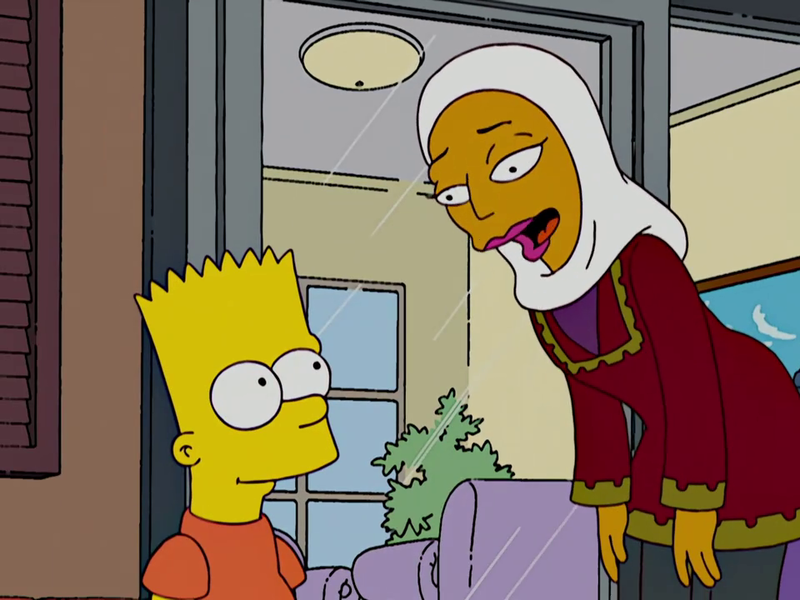 Hussam Ayloush, executive director of the council in Los Angeles, wrote "I applaud your effort in Sunday's episode of 'The Simpsons' to humanize American Muslims by challenging anti-Muslim sentiment in our society by introducing a professional Muslim family. The 'Mypods and Boomsticks' episode highlighted the diverse make-up of Springfield and brought to light how Americans can work toward mutual respect and inclusion by getting to know their neighbors." Modified on November 26, 2017, at 06:46.